S&P Dow Jones Indices recently reported preliminary dividend and buyback information for the third quarter ending 9/30/2018. On a year over year basis stock buybacks for S&P 500 companies are collectively up 57.8% for Q3 2018. For the 12-months ending 9/30/2018 total buybacks increased 39.1%. 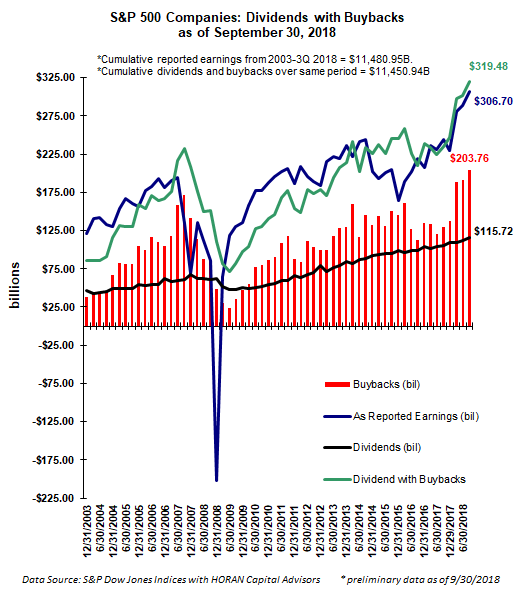 Relative to buybacks, dividends increased a much smaller 9.7% resulting in combined dividends plus buybacks increasing by 36.2% for the third quarter. Year over year operating earnings were reported up 25.8%. For the quarter the top 20 companies initiating buybacks in the quarter accounted for more than half, or 54.3%, of the total buybacks of all S&P 500 firms. In conclusion, I would prefer to see larger dividend increases which would be more of an indication that companies expect to see improved cash flow/earnings over an extended time frame. The recent tax cut is not permanent though; thus firms are likely hesitant to commit to higher dividend payments on an ongoing basis. The most significant tax cut expiration impacting businesses might be the phase out of the full expensing of equipment purchases beginning at the end of 2022. At the moment though, companies seem committed to returning to shareholders some of the cash flow benefits resulting from the tax cut.